In 1215, King John came to Runnymede in order to place his seal on the Magna Carta. This has proven to be one of the most significant events in history. Many of the World’s constitutions have been based on this historic document, including the United States of America. In 2015 the world celebrated its 800th anniversary. 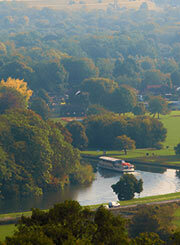 Bring your group to Runnymede and we will show them the sights. There are 3 memorials to see as well as many other points of interest - all will be highlighted in a special commentary. Ankerwycke Priory, now in ruins, is reported to be where King Henry VIII courted his future wife Anne Boleyn in around 1530. Set back slightly from the river the white stone ruin of the Benedictine nunnery of St Marys was built in the 12th Century & offers a glimpse into the past. Behind St Marys (although not visible from the river) stands the infamous Ankerwycke Yew. Many believe that the Ankerwycke Yew is the site of the actual signing of the Magna Carta. This is a male tree with a girth of 8 metres and thought to be 2000 years old. Sitting on top of Coopers Hill, the Air Forces Memorial commemorates the 20,456 Allied airmen & women who have no known grave who died during the Second World War. A stunning setting with views right over London. The British memorial for U.S. President John F. Kennedy was jointly dedicated in May 1965, by Queen Elizabeth II and Jacqueline Kennedy. IN ASSOCIATION WITH the National Trust AT RUNNNYMEDE. The world recently celebrated the 800th anniversary of the sealing of the Magna Carta. This legacy continues and groups are still able to experience the Magna Carta sights at Runnymede. All of the trips on this page take in the Magna Carta sights described opposite. We will provide a special commentary pointing out the sights along with interesting historical facts. We have lunch and tea cruises as well as shorter trips. The 45 minute trip is ideal for school visits or groups that may be passing Runnymede by road on the way to somewhere else. For more details download our “MAGNA CARTA TRIPS” leaflet. All the above listed trips are available from the RUNNYMEDE BOATHOUSE (Please follow link for map & directions). has been produced by Brunel University London. The MAGNA CARTA TODAY exhibition will be based at the Magna Carta Centre at Runnymede and will be open to the public with no admission charge.